Even though massive heaps of luck are involved in poker, the most skilled players consistently come out on top. One way to develop those winning poker skills is to dedicate your life to the game, grinding out entire days and nights in the casino or online. But it is only one way. Many people develop and maintain winning poker skills at their day job. Of course, it’s only through playing poker that can players develop the specific tricks and techniques to beat their opponents, but many careers give them a huge head start. That’s why we see the same professions popping up again and again in poker. 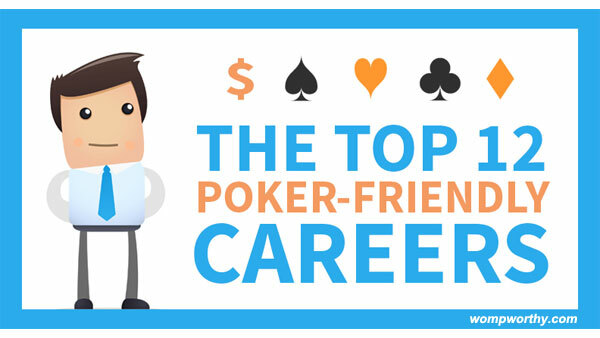 If you have one of these jobs but you haven’t gotten into poker, maybe it’s time that you did. If you already work in one of these industries, perhaps this article will jog your memory as to skills you can develop in tandem, on the job and at the table. And if you’re a good player that’s struggling to make it in poker alone, you might want to take a look at these industries to see if there’s value in there for you to grab. We previously explored the link between entrepreneurship and poker in depth. “Entrepreneur” is such a broad category, it includes anyone who has started their own business. One might say a dedicated, winning poker player is an entrepreneur, in the sense that they took a big risk for a chance to succeed in a lifelong dream, or strike it rich, or both. Poker players and entrepreneurs use their brains to win, and their heart to stay in the game. The similarities truly outnumber the differences. The list of entrepreneurs in poker is too long to mention, and includes everyone from mutli-millionaires like Bill Klein down to solo entrepreneurs who are hustling their bankroll with whatever skills they have. At the upper levels of poker, it’s hard for players to not become entrepreneurs. There is so much low-risk value to be scooped selling products and services around one’s poker knowledge not to go for it. It’s an easy sell to the consumer because investing in poker strategy usually returns the investment quickly and many times over. Nearly every top-notch poker player (our coaches included) are pursuing other revenue streams to offset variance and pad their bankrolls. The entrepreneurial spirit is built into poker, and vice versa. We’ve got our own engineer Doug Hull, author of Poker Plays You Can Use and Poker Work Book for Math Geeks. Well, he was a professional engineer until he quit his day job and moved to Vegas to grind a profit, coach players, and write poker books for a living. You can now call him an engineer of poker. He’s certainly not the only one. The command of math, the ingenuity and inventiveness, the analytical mindset… they are all huge assets when it comes to poker. And poker players make great engineers, because they are always testing new hypotheses, drawing insights from advanced analysis of the results, studying the work of others and applying proven techniques to consistently achieve the desired results. Folks who work in the financial industry could be said to be playing in the highest-stakes poker game on the planet. Sure, it’s not actually poker, but especially in today’s derivatives-laden market, huge risks are being taken with the world’s wealth, and unfathomable sums are won and lost every day. It’s obvious what makes financial analysts, investors, hedge fund managers, etc. so good at poker. They are used to taking risks, viewing losses and wins in a long-term context, and making informed, level-headed decisions with incomplete information. Daftar Poker IDNPLAY skills are in their blood. Programmers, computer scientists, coders… call them what you will, their profession gives them have a huge edge at the table. One of the first programs many coders write when they’re starting out is a poker simulation — it teaches fundamental programming concepts while maintaining some semblance of fun and functionality. Coders tend to learn poker and get better faster than folks from other professions because they are used to plugging leaks. A huge part of programming is debugging systems, and the rush from solving a particularly vexing problem. Though there is no luck in programming per se, systems are always encountering new errors, so coders are usually good at rolling with poker variance and learning from their mistakes. The other great advantage can be seen in the tools we use to analyze strategies to determine optimal game decisions. These tools were programmed by coders! No other profession has arguably made such an indelible mark on serious poker players than the folks who produced HUDs, range analyzers, play tracking software and the other programs we use on a daily basis. That kind of inside knowledge as to how the inner workings of software ticks is pure gold at the table. “Having fun while crunching numbers” is a fairly accurate description of a poker player. The best accountants and bookkeepers are not just great mathematicians and data analyzers, they’re also masters of systems. Detail matters in accounting, and there are hundreds of small but significant factors that can cause tiny errors in data that cascade into enormous problems. These professionals are used to such high stakes for accuracy, that in poker they are some of the best at avoiding mistakes. We see a lot of lawyers in poker, though they might not advertise that fact given the social stigma that can be attached. No career is perhaps better suited to the mind game of poker than lawyers, who are paid to get inside people’s heads, anticipate their decisions in advance, and persuade them down an often different path that achieves the desired result. Lawyers are great talkers at the table, but even when their mouths are shut, their minds are racing down multiple decision trees. Used to courtroom pressure, they are cool and calculated. They are great at adapting their strategy to counter yours on the fly — it’s what courtroom prosecution and defense is all about. Poker and politics have a long history. At one time, poker playing was glorified as an activity that demonstrated great political leadership, resilience under pressure, the ability to negotiate and make good decisions with lots at stake. At some point, poker got a reputation as reckless gambling, a place where shady back-room deals can happen, and it has since fallen out of favor for politicians to publicize one’s poker prowess. It’s easy to see why politicians make great poker players. They are masters in the art of the read. If you’ve ever shaken hands with a top politician, you know they can tell you exactly what you want to hear before you even open your mouth. They are masters at getting you to think their idea is your idea. They can read physical expressions to intuit your mindset. They are master communicators. Their style of poker is probably much less mathematical than most careers on this list, but they make up for it in social engineering genius. Though it may have fallen out of vogue, there are still municipalities where poker is so popular within the government and constituency, an elected representative can curry a lot of favor from important community members just by showing up at the table. And, of course, politics is often all-or-nothing — you are elected, or you lose everything. The risks couldn’t be higher, so these players can be more savvy and cutthroat than most, yet incredible at hiding their cunning. As the marketing industry grows, we are also seeing many more marketing professionals in poker. When these folks aren’t too busy responding to clients around the clock, they can be a serious threat at the poker table. Many marketers are jacks-of-all-trades, and incorporate a little bit of everything from this list. Analytical mindset? Check. Social engineering? Check. Boundless creativity and the ability to simplify complexity to make the right decision under pressure? This might be their biggest asset. Adaptability is another hallmark of marketing. Few industries transform as rapidly as marketing, and marketers know a huge part of their job is learning to leverage new techniques and technologies, almost on a daily basis. They are also used to their actions having a dramatic impact on the bottom line. Our own Dr. Tricia Cardner is the resident poker psychologist, and we think she’s one of the best. And not just at the psychology part — she has real poker skills that have earned her some nice stacks. There have been many books and videos made about poker psychology. We have called the mental game in poker “The Last Edge”. It’s incredible to us how many poker players continue to ignore the mental aspect, to their bankroll’s detriment. In a game where most people are making very few mistakes, psychologists have a huge edge in understanding the reasons behind people’s decisions. Their sense of your thinking is often better than yours! Players who come from psychology backgrounds may not be the fierce number-crunchers of their opponents, but they more than make up for that by anticipating next moves better than most. A therapy or coaching session is much like a poker game, a chess-like mental activity where the psychologist is always thinking a few steps ahead. At the same time, new but incomplete information is constantly streaming into their brains for analysis. Psychologists have the perfect mindset for poker, and all poker players stand to learn a lot from incorporating their strengths into their own games. There are many athletes in poker. Poker players are drawn to the competition, to the conditioning, to the discipline. Many poker players, while not professional athletes, nonetheless pursue the gym or some other athletic activity with great passion. Of course, it’s the professional athletes in poker that get all the attention, particularly at the WSOP. From Michael Phelps to Paul Pierce, the list is long. We’re sure stamina, endurance, self-determination, mental fortitude and resilience to adversity are the hallmark traits that make them tough opponents. Athletes are second only to actors and actresses when in comes to the celebrity factor in poker. And why not? After all, poker is acting! The stars of film, TV and the web are keenly geared for poker beacuse they bluff for a living. They are going to often have deficiencies in the mathematical aspect, but that’s offset by enormous control over their mental game, and the ability to manipulate others into thinking what they want them to think. Again, the list of actors and actresses in poker is long and star-studded, and includes A-listers like Tobey Maguire and Ben Affleck. The ones that truly succeed understand poker as a game inside and out, and know exactly how to exploit the fact that their opponents are (a) a little starstruck and (b) think they’re acting all the time. This one is almost too obvious to write about, but not including it would be absurd. Sure, some poker dealers stay away from the game, in much the same way a short order cook might not want to make their own dinner after a 12-hour shift. But more often than not, your dealer is picking up on the game during their whole shift. What else is there to do?